Outdoor fun is best on Huffy bikes with friends and family. Riding with the Disney's famous sisters from Frozen makes it more fun than ever before. Elsa and Anna are featured throughout the bike, starting with the handlebar bag. Designed with durable neoprene material, the removable bag is the perfect size for young girls. The handlebar also features a decorated pad and sparkly streamers. The sky blue bike includes a padded seat for comfort. The single-speed bike has an easy-to-use coaster brake. 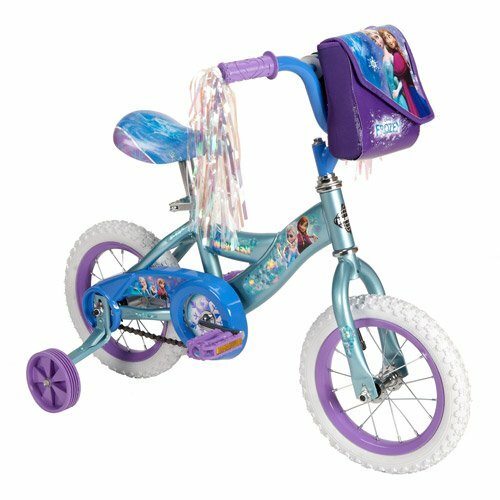 Wide training wheels provide added stability.Please note: If you select Site to Store delivery, your bike(s) will not be assembled upon pickup.12" Huffy Disney Frozen Girls' Bike:Disney Frozen graphicsRemovable Disney Frozen purse and decorated handlebar padFrame: steel bicycle frame in Sky BlueGearing (# of speeds): single speedBrakes: easy-to-use coaster brakeWheels/tires: 12" x 1.75" sidewalk hugging tiresRims: durable steel rims painted purpleHandlebars: hi-rise handlebar in So BlueSeat: decorated and padded seat with quick-release for easy adjustmentPedals: jr. size pedalsAssembly: clear assembly instructions includedDimensions: 34"L x 20"W x 28"HSee all Disney Frozen on Walmart.com.